For one night, at least, amid the excitement of a pennant chase, John Curtis showed the Cardinals a flash of the talent they’d expected when they acquired him as the key player in a trade with the Red Sox. On Aug. 29, 1974, Curtis delivered the best performance of his Cardinals career, pitching a one-hitter in St. Louis’ 3-1 victory over the Padres at San Diego. The win moved the Cardinals within a half-game of the first-place Pirates in the National League East with a month remaining and raised hopes St. Louis would earn its first postseason berth in six years. Curtis, a left-hander, earned 13 wins with the 1973 Red Sox. That impressed the Cardinals and in December 1973 they acquired Curtis and pitchers Lynn McGlothen and Mike Garman from the Red Sox for pitchers Reggie Cleveland and Diego Segui and infielder Terry Hughes. Curtis appealed to the Cardinals as a left-handed starter who might silence the bats of premium left-handed batters within the division such as the Pirates’ Willie Stargell, Dave Parker, Al Oliver and the Mets’ Rusty Staub and John Milner. The Cardinals entered 1974 with a rotation of Bob Gibson, Curtis, Alan Foster, McGlothen and Sonny Siebert. Curtis, the lone left-hander, got off to a terrible start, losing five of his first seven decisions as his ERA swelled to 5.83, but Schoendienst kept him in the rotation. On Aug. 29, a Thursday night, before 6,042 spectators, Curtis got the start against the hapless Padres, who had the worst record in the National League and would finish with 102 losses. The Padres did have a couple of sluggers who batted right-handed _ Nate Colbert and Dave Winfield, who was in his second season of what would become a Hall of Fame career. Curtis retired the first 21 batters in a row. Seven perfect innings. Ted Simmons, catching Curtis, hit a home run in the seventh, breaking a scoreless tie. Winfield, who two months earlier had hit a home run off Curtis for the lone run in a 1-0 Padres victory, led off the bottom of the eighth and watched the first three pitches sail out of the strike zone. Winfield walked, “but that didn’t concern me too much,” Curtis said. Cito Gaston bunted, moving Winfield to second. Derrel Thomas walked and Dave Hilton flied out to right, advancing Winfield to third. With two outs and two on, Fred Kendall, who hadn’t gotten a hit in a week, singled to left, breaking up the no-hitter and scoring Winfield with the tying run. Curtis’ work wasn’t done. With Thomas on second and Kendall on first, left-handed slugger Willie McCovey was sent to bat for pitcher Randy Jones. McCovey, a future Hall of Famer, flied out to center. In the ninth, after Padres reliever Larry Hardy retired the first two batters, the Cardinals got four consecutive singles from Bake McBride, Ken Reitz, Jim Dwyer and Mike Tyson _ the latter two driving in a run apiece. The Cardinals would finish in second place, 1.5 games behind the Pirates. Curtis was 10-14 in his first year with the Cardinals and led the club in losses. 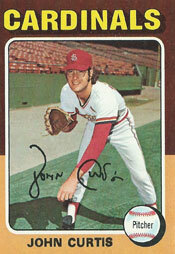 He posted records of 8-9 in 1975 and 6-11 in 1976 before the Cardinals traded him to the Giants. In 109 games, including 62 starts, Curtis was 24-34 with a 3.88 ERA for the Cardinals. Nice article. Curtis never panned out. Should have kept Carlton and reuss. There were two lefties much better than curtis. Thank you. I recall that John Curtis became a sportswriter after his pitching career ended.